Sheaf Dale in Portmahomack, near Tain, Northern Highlands sleeps 6 people. Sheaf Dale near Tain is set in open countryside, above the charming seaside village of Portmahomack; Sheaf Dale is a beautifully presented cottage with a private hot tub in the gardens. This single-storey, terraced, whitewashed stone cottage is tucked away along a quiet lane on the owner’s working arable and sheep farm. It has been painstakingly restored and renovated throughout and provides a good standard of accommodation in a peaceful yet accessible location. The large, airy living room looks out across the fields, and there is a spacious, well-equipped kitchen/dining room, with plenty of room for up to six guests. The master bedroom features a super king-size bed and a wall-mounted TV, and both the double bedroom and the bunk bedroom are superbly presented with colour-coordinated soft furnishings. Exposed stone walls and large canvases of the local area add to the property’s charm. There is a secluded lawned garden with a sandstone patio area that leads down to the feature hot tub, making this an ideal property for couples, honeymooners and families wishing to have a relaxing, pampering holiday. The picturesque seaside village of Portmahomack is just 1 mile away, with its sweeping sandy beach and stunning mountain backdrop, it is a superb spot to walk, picnic, swim or kayak. There is a small harbour with a pier, ideal for a spot of crabbing or fishing. The village has a good selection of amenities, including a shop, pub and café, as well as a renowned seafood restaurant. A traditional links golf course is just a short walk away and there are numerous other renowned golf courses in the area including Royal Dornoch. The region is renowned for its archaeological sites and at the nearby Tarbat Discovery Centre there is a fascinating display of Pict, Norse and Medieval artefacts. Within a 10-minute drive lies the oldest Royal Burgh of Scotland. Predominantly built out of local sandstone, Tain is a charming historic town which offers an excellent selection of small shops, restaurants, cafés and pubs, as well as a wide variety of sporting and recreational facilities. Nearby places of interest include the whisky distillery centre, home of Glenmorangie single malt, the famous Falls of Shin, one of the few places to see salmon leaping close to hand, and the enchanting town of Dornoch, with its magnificent cathedral, sandy beach and championship golf course. This lovely cottage is ideally located for exploring the whole of the Highland region. 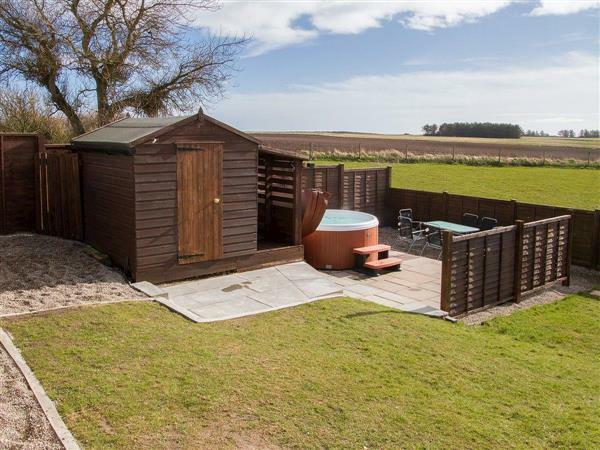 When you return at the end of the day, relax in the hot tub whilst you drink in the uninterrupted views across the countryside to the sea beyond. You will find the beach, shop, pub and restaurant 1 mile from Sheaf Dale near Tain. Sheaf Dale can be booked together with The Paddock (ref UK5049 [The Paddock]) to sleep up to 11 people. Living room: With electric fire, 42 Sky TV (family package) and DVD player. Bedroom 1: With super king-size bed and 20 Freeview TV. Electric central heating, electricity, bed linen, towels and Wi-Fi included. Welcome pack. Enclosed garden with patio and garden furniture. Hot tub for 6 (private). 2 dogs welcome, to be kept on a lead at all times (working farm). Private parking for 2 cars. No smoking. Please note: There are 2 steps in the garden. Holidays at Sheaf Dale run from Saturday to Saturday. Pets allowed at Sheaf Dale. For a better idea of where Sheaf Dale is, you can see Sheaf Dale on the map below. Do you want to holiday near Sheaf Dale (UK5740), you can see other cottages within 25 miles of Sheaf Dale; have a look to find your perfect holiday location.